I’m a saver of stuff. I was once told that my desk looks like it belongs to “a Nisei hoarder.” I’m not exactly certain what that means or if the comment was said with respect or horror but, I get the idea. My parents still live in the house that I grew up in and the room I’ve had since childhood is full of so many little personal treasures. 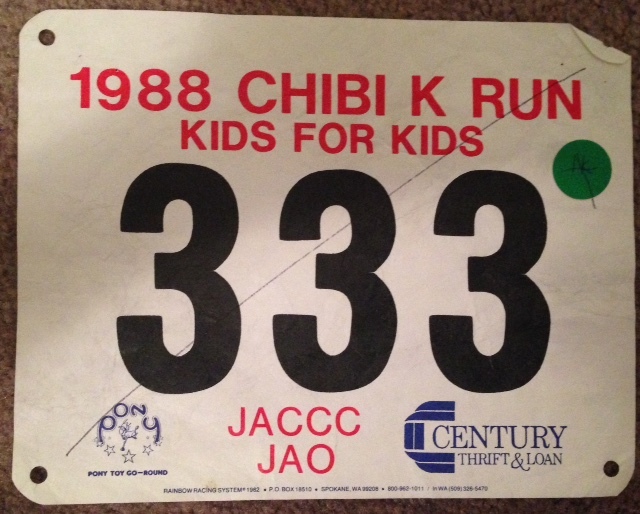 Recently I was at their house and discovered my bib number from the 1988 Chibi-K Run at the Japanese American Community and Cultural Center (JACCC). This was a non-competitive run for kids that was part of Children’s Day. I hadn’t thought about this event for a long time, and I certainly don’t need the bib anymore, but in the end, I couldn’t bring myself to throw it away. As I consider why I want to keep it, I think it’s because it serves as a reminder of the wonderful relationship I’ve had with Little Tokyo for as far back as I can remember. It’s a neighborhood that I’ve only grown to appreciate more and more as I’ve gotten older. "As I consider why I want to keep it, I think it’s because it serves as a reminder of the wonderful relationship I’ve had with Little Tokyo for as far back as I can remember. It’s a neighborhood that I’ve only grown to appreciate more and more as I’ve gotten older." Lynn dressed in a yukata at the JACCC garden. When I reflect on growing up in the suburbs of northern Los Angeles County, most of my memories are of places my parents took me to that were beyond the boundaries of my hometown. With few options for Japanese food where we lived, we would pack a large cooler in the car and drive downtown to go grocery shopping at Yaohan market. I used to love going up and down the escalators in the mall that is now the Little Tokyo Shopping Center after dinners at various Japanese restaurants. I have fond memories of attending festivals, learning Japanese calligraphy, dancing ondo, playing on the JACCC plaza, and visiting the Japanese American National Museum (JANM). 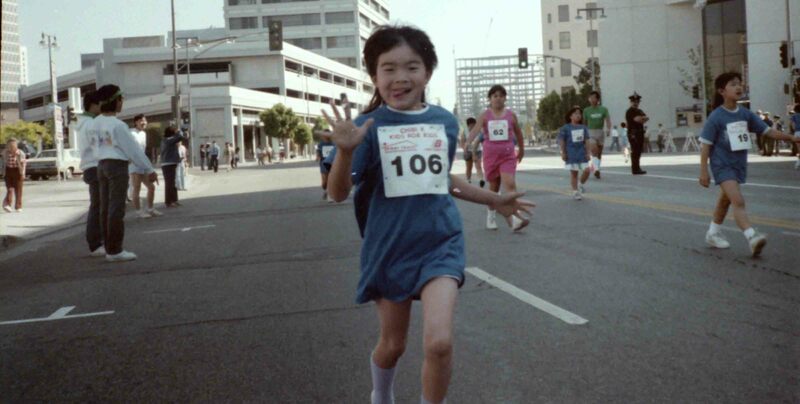 These excursions to Little Tokyo probably shaped my identity more than I realized at the time. Much has changed over the years, and while some of the events and places in my memories no longer exist, the feelings I get from coming here remain, and are stronger than ever. When I think of Little Tokyo, I feel comfort, pride, and a sense of my own history. "These excursions to Little Tokyo probably shaped my identity more than I realized at the time." Lynn dancing ondo at the JACCC in 1986. For the past 10 years, I’ve worked at JANM. I love that I get to come to Little Tokyo on a daily basis and be a part of this community. My time here came upon my return to Southern California after several years of living on the East Coast. After being away, landing in this familiar neighborhood brought an instant sense of belonging. I realize that though I’ve never actually lived in Little Tokyo, it is a place I’ve been coming home to for my entire life. I know others share this sentiment. "I realize that though I’ve never actually lived in Little Tokyo, it is a place I’ve been coming home to for my entire life." 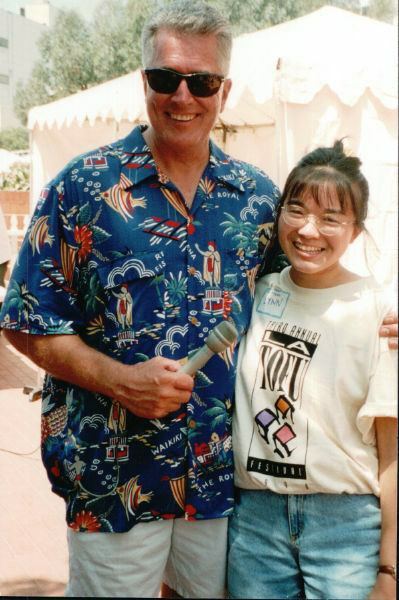 Lynn with Huell Howser at the 1998 Los Angeles Tofu Festival. In my work, a big part of my role is to welcome young visitors to the museum, whether that be on school field trips or at larger events. I help them make crafts, origami, and other little mementos of their time at the museum. I hope I am making people feel that they have come home to Little Tokyo, regardless of how near or far they’ve traveled to get here. I hope I am contributing to the creation of great memories of this special place and that decades from now, an adult will come across something they got here that is so special they’ll never want to throw it away. Lynn Yamasaki is the currently the Interim Director of Education at the Japanese American National Museum. She has worked at the museum for over 10 years and has shared her experience on what Little Tokyo means and what it feels to be a contributor to the community.